Draft: 2012, Toronto Blue Jays, 3rd rd. Anthony Joseph Alford ... Attended Petal High School in Mississippi, where he was quarterback in addition to playing baseball... As a senior he recorded 2,058 passing yards and 20 passing touchdowns, in addition to 1,731 rushing yards and 24 rushing touchdowns, earning a spot in the U.S. Army All-American Bowl...In the same year he batted .483 with four home runs and went 14-for-14 in steals ... 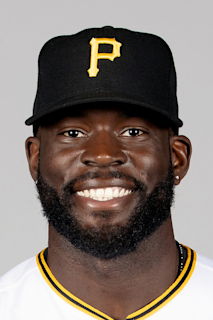 Following his selection by Toronto in the 2012 draft, continued to play football, first as QB the University of Southern Mississippi and then as a DB at the University of Mississippi after a transfer...On Sept. 30, 2014, elected to pursue baseball full-time ... Ranked as the Blue Jays' 3rd-best prospect by Baseball America entering 2018 (2nd in 2017 and 1st in 2016)... Ranked as MLB's 47th overall prospect entering 2018 by MLB Pipeline ... Has a wife, Bailey, whose sister is married to teammate Jonathan Davis ... Paricipated with former teammate Curtis Granderson, former Blue Jay Fred Lewis, and other professional ball players in Mississippi Dream Weekend, a camp which provided hundreds of kids ages six through 18 with the opportunity to spend time with professional athlete mentors in January, 2019. Recalled from Triple-A Buffalo on May 5 and Sept. 17 ... Made his season debut on May 6 at TB and went 1-for-4 with his 1st career steal and 1st career run ... Started the season on the DL with a right hamstring strain ... On May 12 vs. BOS, recorded his 1st career RBI with a 4th-inning single. Assigned to Double-A New Hampshire to begin the season ... Was recalled from the Fisher Cats on May 19 after hitting .325 through 33 games...Made his MLB debut that night in Baltimore with a start in left field (0-2, K) ... Recorded his 1st career hit on May 23 at MIL, a pinch-hit double off Rob Scahill in the 7th inning ... Went 1-for-8 in four games with the Blue Jays before being placed on the DL with a left wrist hamate fracture on May 24 ... Hit .310 (76-for-245) with 19-XBH and 18 stolen bases in 68 games for New Hampshire before earning a promotion on Sept. 1 to Triple-A Buffalo...Went 4-for-12 with a double in three games for the Bisons ... Was named an MiLB Organizational All-Star at the end of the year. Was invited to Major League spring training on January 12, 2016 and later reassigned to minor league camp on March 12...Assigned to the Dunedin Blue Jays to open the 2016 minor league season...On June 10, suffered a concussion after colliding with a teammate in the outfield, and needed to be stretchered off the field...Returned from injury on June 22... After the season, was assigned to the Mesa Solar Sox of the Arizona Fall League...On Oct. 31, was named an AFL All-Star....Added to the 40-man roster after the season (protection from the Rule 5 draft)...Appeared in 23 games for Mesa during the Fall League season, and hit .253 with three home runs and 15 RBI...Named an AFL Rising Star at the end of the season. April 4, 2019 Toronto Blue Jays optioned CF Anthony Alford to Buffalo Bisons. April 2, 2019 Toronto Blue Jays recalled CF Anthony Alford from Buffalo Bisons. March 19, 2019 Toronto Blue Jays optioned CF Anthony Alford to Buffalo Bisons. September 17, 2018 Toronto Blue Jays recalled Anthony Alford from Buffalo Bisons. May 14, 2018 Toronto Blue Jays optioned CF Anthony Alford to Buffalo Bisons. May 5, 2018 Toronto Blue Jays recalled Anthony Alford from Buffalo Bisons. April 19, 2018 Toronto Blue Jays optioned CF Anthony Alford to Buffalo Bisons. April 15, 2018 OF Anthony Alford assigned to Dunedin Blue Jays. April 9, 2018 Toronto Blue Jays sent OF Anthony Alford on a rehab assignment to Dunedin Blue Jays. March 29, 2018 Toronto Blue Jays placed CF Anthony Alford on the 10-day disabled list retroactive to March 26, 2018. Right hamstring strain. November 21, 2017 CF Anthony Alford assigned to Charros de Jalisco. October 2, 2017 Toronto Blue Jays recalled CF Anthony Alford from Buffalo Bisons. September 1, 2017 CF Anthony Alford assigned to Buffalo Bisons from New Hampshire Fisher Cats. July 25, 2017 Toronto Blue Jays optioned CF Anthony Alford to New Hampshire Fisher Cats. July 25, 2017 Toronto Blue Jays reassigned LF Anthony Alford to the minor leagues. July 21, 2017 Toronto Blue Jays sent CF Anthony Alford on a rehab assignment to New Hampshire Fisher Cats. July 12, 2017 Toronto Blue Jays sent CF Anthony Alford on a rehab assignment to Dunedin Blue Jays. May 24, 2017 Toronto Blue Jays placed CF Anthony Alford on the 10-day disabled list. Left hamate fracture. May 19, 2017 Toronto Blue Jays recalled CF Anthony Alford from New Hampshire Fisher Cats. March 17, 2017 Toronto Blue Jays optioned CF Anthony Alford to New Hampshire Fisher Cats. November 18, 2016 Toronto Blue Jays selected the contract of Anthony Alford from Dunedin Blue Jays. June 22, 2016 Dunedin Blue Jays activated CF Anthony Alford from the 7-day disabled list. June 11, 2016 Dunedin Blue Jays placed CF Anthony Alford on the 7-day disabled list. May 2, 2016 Dunedin Blue Jays activated CF Anthony Alford from the 7-day disabled list. April 10, 2016 Dunedin Blue Jays placed CF Anthony Alford on the 7-day disabled list. January 12, 2016 Toronto Blue Jays invited non-roster CF Anthony Alford to spring training. June 25, 2015 CF Anthony Alford assigned to Dunedin Blue Jays from Lansing Lugnuts. April 21, 2015 Lansing Lugnuts activated CF Anthony Alford from the 7-day disabled list. April 6, 2015 Lansing Lugnuts placed CF Anthony Alford on the 7-day disabled list. January 28, 2015 Toronto Blue Jays invited non-roster CF Anthony Alford to spring training. September 18, 2014 Lansing Lugnuts activated CF Anthony Alford from the temporarily inactive list. July 10, 2014 Lansing Lugnuts placed CF Anthony Alford on the temporarily inactive list. July 1, 2014 OF Anthony Alford assigned to Lansing Lugnuts from Bluefield Blue Jays. April 1, 2014 OF Anthony Alford assigned to Bluefield Blue Jays from Lansing Lugnuts. September 23, 2013 Lansing Lugnuts activated OF Anthony Alford from the temporarily inactive list. July 3, 2013 Lansing Lugnuts placed OF Anthony Alford on the temporarily inactive list. July 2, 2013 OF Anthony Alford assigned to Lansing Lugnuts from GCL Blue Jays. July 2, 2013 Anthony Alford roster status changed by Lansing Lugnuts. April 12, 2013 Anthony Alford assigned to GCL Blue Jays. September 27, 2012 Lansing Lugnuts activated OF Anthony Alford from the temporarily inactive list. June 23, 2012 OF Anthony Alford assigned to Lansing Lugnuts from GCL Blue Jays. June 18, 2012 Anthony Alford assigned to GCL Blue Jays from Toronto Blue Jays. June 11, 2012 Toronto Blue Jays signed OF Anthony Alford.